add it to the list is brought to you by In My Mailbox, hosted by Kristi at The Story Siren. 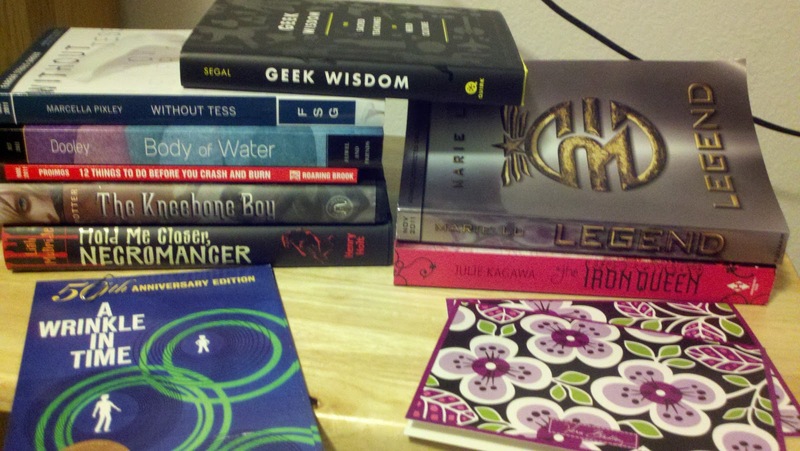 essentially, this meme allows bookish folk to share the goodies they got in the mail (or from other various sources). for those of you not interested in a massive TEN MINUTE vlog (sorry. this was even after 3 takes), here's some written action for you. 50th Anniversary Celebration postcards for A Wrinkle In Time by Madeline L'Engle! the first 5 people to email me and request one of these lovelies will get one in the mail. i can't believe this book is 50 years old...it's still one of my faves! it's one of those rare books that has a childlike fantasy element that's complimented by many levels of mythos and enjoyment. kinda like Chronicles of Narnia. Two sisters share a fantasy world. One moves on, one does not. why i'm interested: i love books that examine the relationships between family members. also, i'm not entirely sure if Tess actually escapes into the fantasy world, or if she just goes nuts. either way, i'm intrigued. also, we get to peep in her diary! Ember's house is burned down and she has to rebuild her entire life from nothing. why i'm interested: the cover is lovely. yeah, i said it. but also, it's a middle grade read about survival. typically the whole 'heading into the unknown' scene is YA, so i'm interested to see how a MG read handles that. Hercules has two weeks to accomplish 12 tasks before the summer is over. why i'm interested: i love lists. A LOT. also, this little guy is a short read, so i'm interested to see how much we get in such a short frame. Available in hardcover now! And in paperback this fall. Three quirky siblings head to an aunt's mansion and discover spooky and scary things. Mystery ensues. why i'm interested: i love books that are just a bit off the beaten path, and this certainly fits the bill. A creepy and violent Douglas alerts Sam that he is a necromancer. He's pressured to join the dark side or face consequences. why i'm interested: i've heard such good things from many bloggers, including Leila of Bookshelves of Doom and from April of Good Books and Good Wine. i trust their judgement for sure, and like a book with some spooky elements woven in. Using quotes from Lord of the Rings, Harry Potter, ThinkGeek, The Tick, and many more, this geekish goodness provides little nuggets of wisdom by musing on the nerdier elements of media and pop culture. why i'm interested: hello? I'M A NERD. A rich girl named June and a criminal named Day are on the run and are uncovering the nasty truths of their corrupt country. why i'm interested: Jacinda and Yani highly recommended it to me! as if i need anything more than that. but if you need more than that, i love dystopian. i just cannot get enough! why i'm interested: this book has taken several of my book blogger friends by storm! i must know what all the buzz is about. plus, it's been awhile since i've read a faerie book. i'm due. this lovely lady sent me two separate mailings, BOTH with the ADORABLE Vera Bradley cards you see in the picture. seriously, it's an awesome week when you get new music and a new bookmark. thanks, Ginger! so i had just finished reading I Am The Messenger and could not stop thinking about it. i mentioned my adoration and fascination with the book, and then this happened. I KNOW. I DIE. anyway, i was put in contact with him and he was open, thoughtful, and shared with me some really cool pieces of his process and the characters and was just generally down-to-earth and as awesome as you would expect him to be. "To get to your questions now, it's usually the little things in characters that ring true. I will take a very small thing in real life (like a friend who is known to be very tight with money - a mate of mine called Bruce) and turn him into Marv. I'll give him a good reason to be tight with money. Then Ritchie. I knew a guy with a tattoo of Jimi Hendrix on his arm that we all said looked more like Richard Pryor...I had a German Shepherd-Rottweiler but it was a girl and she only lived to be about 11. But I had a border-collie who grew to be very old...and the characters take on new things every day. I think the point is, as soon as you make one thing up about a character, they're not really the person they're based on anymore. They are completely themselves. As for Ed, Ed is me at that age, even if I never drove a taxi. His voice is me. If we bumped into each other today, you'd say, 'That's not Ed Kennedy!' But I think when we write, we channel memories of how we were. And the memories last longer than how we actually were. And the memory is what goes into the writing - if that all makes sense. I'd probably change each and every chapter in some way - except the first one, in the bank. That was one of those chapters that wrote itself. I'm not sure I've had the experience since. It's also worth saying, too, that if I did change things in I am the Messenger now, the book wouldn't be better. At the moment I'm wrestling with a chapter in my new book (I've been fighting the same ten pages for a long, long time), and if I've learned one thing, it's that there's a big difference between writing something CORRECTLY and writing it RIGHT. And the second one is better. " regardless of the fact that nothing, NOTHING, will top a conversation with Markus Zusak in your mailbox this week, i'd still love to check it out! link up at The Story Siren, or leave me a comment down below. I would email you but i couldnt find your email address. O well will be checking out A Wrinkle in Time and really want to read Legend and tge Iron Fae Series. Wow! I'm so jealous that you got to chat with Markus! He's amazing and I love his honesty! I am Messenger was a favorite of mine too. :) Thanks for sharing with us! That is a wonderful conversation with Markus! Will need to check out that book sometime soon. A Wrinkle in Time was one of my childhood favorites - wow 50 years old! I'm sure you will enjoy The Iron Fey series and Legend. That was a good win! You crack me up. Thanks for vlogging. Hold Me Closer, Necromancer cracks me up just saying. I have to get it. I am glad that Yani gave you the hook up on The Iron Fey series. It is great & a great one to share with younger YA readers. But it is kind of like Shrek...the older you are you'll lol at all the pop culture quotes she snuck in via Puck. Wow, you got a ton this week!! I hope you enjoy it all! I just PAUSED your vlog to let you know (sheepishly) that I have never read A Wrinkle in Time. So upset am I about this lately, in fact, (no kidding) that I have been creeping on my library almost nonstop. But they never have a copy that I want to read (children can be so unkind to books-I need a beautiful copy to experience what I KNOW will be a beautiful book). SO I have decided just about three days ago that I will have to buy this book for myself. It makes me giddy with excitement when I think about it. I didn't even want to listen to it on audiobook, I want the REAL THING. Like, in my hands. But a nice, pretty copy. Dude. Zusak. Nothing I can say about that that you haven't already THOUGHT or don't already KNOW. So, WOW. Also, THE IRON FEY. Rock those books, girl. I have loved them HARD lately. As always, your posts brighten my morning, afternoon, or night. Amy - that makes me want to read the series even more! Asheley - there is no shame here. NO SHAME ZONE. but the sooner you can get on that book action, the better. if you want a free review copy, email me! Yani - i did not realize that! my mistake has been corrected in the written version, but not the vlog. I haven't watched the video yet (because I'm at work with no sound, boo!) but I wanted to tell you that you are so welcome :-) Enjoy the musics!! Awesome. Markus Zusak is so good! And seems to be such a nice guy! I can't wait to read the new book Zusak mentions in his reply to you.